Sometimes snacking is absolutely essential, like during major sporting events or suspenseful movies. In most cases, these snacks are satisfyingly savory and addictive, and often we clear a whole counter of food without even realizing it. Such are the miracles of mindless eating. However, with these healthy, easy and delicious snacks below, you won't have to feel bad about it! Plus everyone will think you are the greatest host ever. Perfect for any get together, Superbowl included. Looking for an easy guide to healthy eating? Download our Fresh Start Clean Eating Plan! This recipe is simple,easy and a crowd pleaser. It hit all the marks: sweet, salty, spicy, and has a great creamy texture on the inside. The most important thing is to not crowd the sweet potato fries on the baking sheet so that they get nice and crispy. Enjoy! This recipe is simple, easy and a crowd pleaser. It hit all the marks: sweet, salty, spicy, and has a great creamy texture on the inside. Plus enjoy the added benefits of vitamins C, B6, potassium and dietary fiber at no extra charge. The most important thing is to not crowd the sweet potato fries on the baking sheet so that they get nice and crispy. Enjoy! Preheat oven to 450 degrees and line two baking sheets with aluminum foil. Cut sweet potatoes into half inch sticks, toss in a bowl with olive oil, 3/4 tsp salt and 1/2 tsp freshly ground black pepper. Spread evenly on baking sheets and bake for 15 to 25 minutes until lightly browned. Let cool and sprinkle with another pinch of sea salt. For the dip, whisk together yogurt, sriracha and lime juice. Mix in chopped cilantro or use to garnish on top. Serve with fries. A healthy, addictive crunchy snack that will be an instant hit on the superbowl snack table. 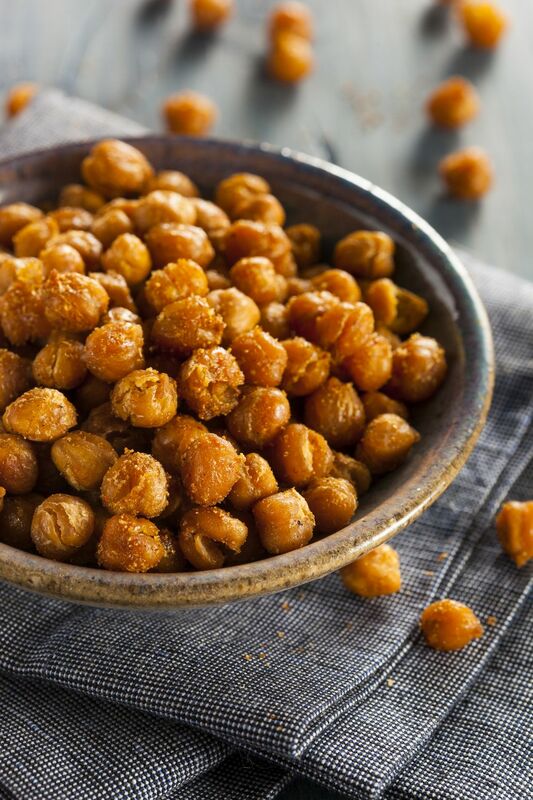 Chickpeas provide protein and fiber, while using a touch of honey adds sweetness and antioxidants. Cinnamon also helps to regulate the appetite. Snack away. Preheat oven to 450 degrees. Drain the chickpeas, rinse, and then dry thoroughly; removing all excess water is paramount to a crunchy product. Spread chickpeas evenly over silipat or wax paper lined baking sheets. Do not crowd. Bake for 40-50 minutes. They will turn crunchy. Mix olive oil, honey, cinnamon, cayenne and salt in a large bowl. Toss crunchy chickpeas in honey mixture and return to baking sheets. Bake for 10 more minutes, honey mixture will caramelize. Remove from oven and allow to cool, then serve. 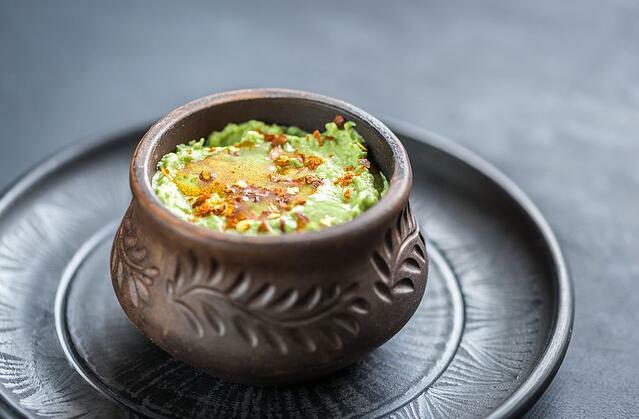 That's right, a creamy and delicious green dip with no avocados that's equally as delicious and amazingly healthier. It's got fewer calories, it's packed with protein and it only takes a pot and a food processor. This is a vegan version, but if you don't mind the milk, you can substitute goat cheese, greek yogurt or fat free cream cheese for the tofu. Serve with tortilla chips or pita, and watch it disappear. Steam the broccoli in large pot with until fork tender (so softer than you might normally cook it). Transfer broccoli to a food processor. Add all the remaining ingredients then blend until smooth and creamy consistency is achieved. If you would like it creamier, add another tbsp of olive oil and blend again and process until smooth, add additional olive oil for a smoother texture. Transfer to a bowl and top with a sprinkle of chili power or chopped cilantro for garnish. Serve warm with chips, veggies or pita.